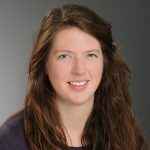 I recently wrote a post with tips for Making the Switch from ArcMap to ArcGIS Pro. 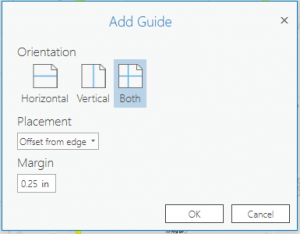 One of the biggest reasons to make the switch to ArcGIS Pro is the ability to create multiple layouts from a single map view, and store them all in a single project file. However, there are a few key differences between ArcMap and ArcGIS Pro that can cause frustration when first creating layouts. 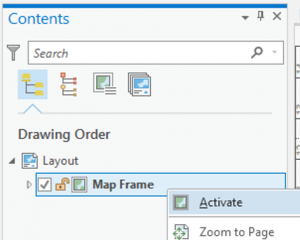 Here are few tips to help you get started with map layouts in ArcGIS Pro. Use bookmarks to specify map extent. Once you’ve decided on the extent to map, create a bookmark. Then, insert a new layout, click Map Frame, and select a bookmark. To change the extent of your map after you’ve started your layout, right-click the Map Frame (under Contents) and select Activate. You will then be able to zoom and pane around the map. When the new extent is set, click Layout at the top of the map view to return to layout view. You can also get to the Activation from the Layout tab on the ribbon (when Layout is selected in the Contents pane). Turn elements on or off. Re-order elements so that they appear above or below another element. Toggle the lock to prevent elements from being inadvertently selected or moved. Turn layers on or off in the legend. Customize north arrow or legend using the Format tab in the ribbon. The ability customize directly from the ribbon is guaranteed to save time and clicks! Ensure the element you are customizing is selected in the Contents pane. For legends and other complex elements, look for a dropdown menu to select the component (e.g. background, border, etc.) you’re altering. Elements can also be customized by right-clicking and selecting Properties. Set horizontal and vertical margin guides in one step. Right-click the ruler and select Add Guides. Select Both, and use the Offset from edge placement. Use built-in centering and alignment. As you move a text box (or other element) in your layout, dashed lines will appear to indicate when it is centered in the map frame, or aligned to another map element. Data Driven Pages is now called Map Series. 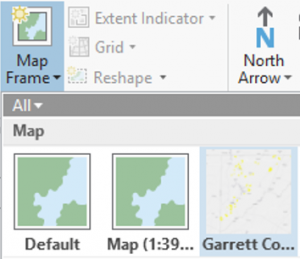 Use the Map Series functionality (Layout tab of the ribbon) to generate a set of maps with the same layout using an index layer to specify the extent. Check back for more tips for using ArcGIS Pro for symbolization, geoprocessing, editing, and more.